The National Treatment (NT) obligation, a key standard of protection in international trade and investment law, requires that the contracting parties to investment agreements provide to foreign investors and their investments treatment no less favourable than that accorded to their own investors and investments. This obligation not to discriminate on the basis of nationality is provided in the vast majority of international investment agreements and the CETA is no exception. 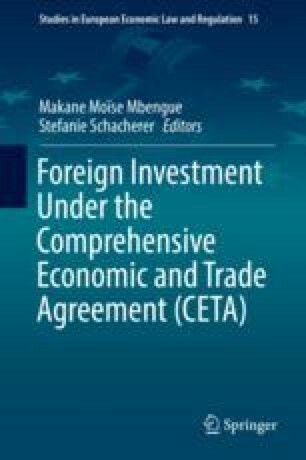 The CETA’s NT provision, found in Article 8.6 of the Investment Chapter, does not differ significantly from NT provisions in other international investment agreements. Thus, the interpretation and application of the standard under the CETA will likely still entail a three-step analysis to identify whether the investor is in “like circumstances” with respect to domestic investors, whether it suffered nationality-based discriminatory treatment, and whether the discriminatory treatment was justified. However, the CETA’s NT provision nevertheless presents some specific characteristics. The CETA contains numerous exception clauses, both general and specific, which is consistent with a more general trend in recently concluded investment and trade agreements. Second, because the CETA imposes slightly different obligations on sub-federal (and sub-national) government units, the way that its obligations will be interpreted when an EU Member State is implementing an EU regulation or directive raises some interesting interpretive questions.